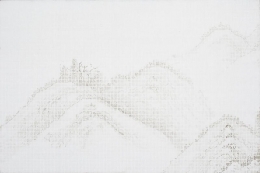 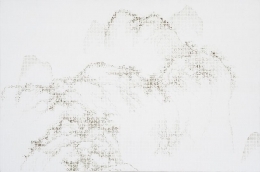 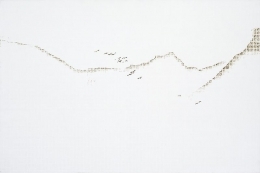 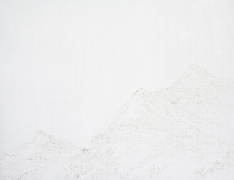 James Cohan Gallery Shanghai is pleased to present Beyond the Mountain, a solo exhibition of new paintings by Jun Jun Hu. 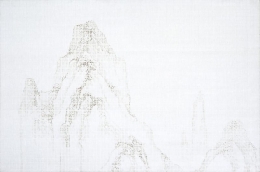 The exhibition opens on September 12 and will continue through November 3, 2013 and is the artist’s debut exhibition at the gallery. 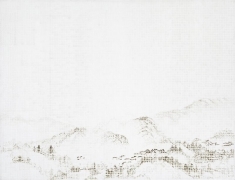 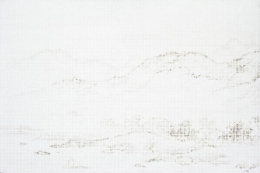 The subject of mountain landscapes or Shan shui 山水paintings have a long and revered place throughout the whole history of Chinese art. 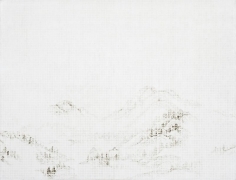 Mountain-water paintings, dating from five dynasties (Song, Jin, Yuan, Ming, and Qing), were viewed with varied philosophical and spiritual imperatives in their depiction of the natural world and connection to mysticism—the land of the spirit world and the embodiment of heaven. 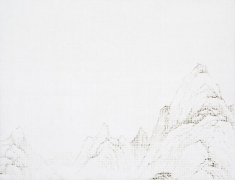 These paintings were sometimes symbolic of the Imperial Court and the structure of society and social order, whereas the Taoist and Buddhist readings stressed how human presence played a minor role in the vastness of the universe. 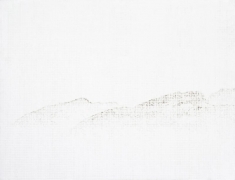 Jun Jun Hu’s new paintings, a cycle of twenty-four monochromatic grid-based works, are based on similar ideas, but lean more toward the spiritual and painting-as-process, both in terms of meditation and as a means in which to build methodical compositions. 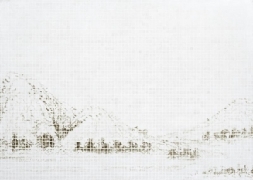 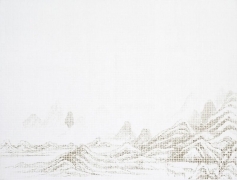 Taking specific fragments from historical Chinese landscape paintings, Hu builds an intricate and precise visual experience by first creating an all-over grid structure (each grid measuring 1.8 cm) then painting frame by frame in order to create the completed image. 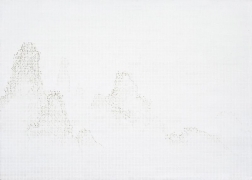 Each painting is thus a series of systematic and clear visual incidents. 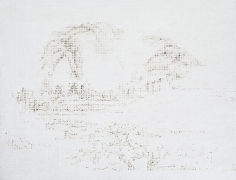 Because of the intricate, labor-intensive brushwork each grid goes against any idea of pixelation or digital suggestion. 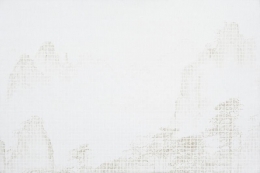 An evident connection with minimalism and post-minimalism as Hu’s aesthetic foundation also comes to mind. 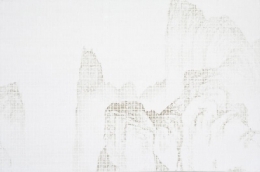 But like the ancient Shan shui painters of the exhibitions, her works challenge the commonly held definition or assumption of what a painting is or should become, seeing the work not merely as a reinterpretation of history or discussion with the exhibitions through selective appropriated historical images, nor merely the depiction of what is identifiably nature or the natural world; but rather what the thought of nature becomes in the viewer’s mind. 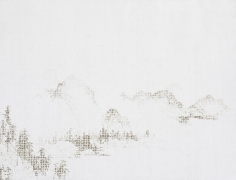 Jun Jun Hu was born in 1971 in Shanghai, China (originally from Shaoxing, Zhejiang province). 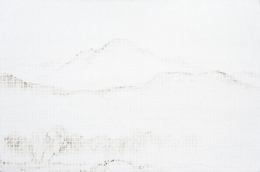 She started her college studies in economic management in 1990 and then stopped in 1992. 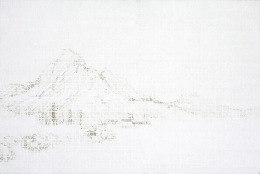 In 1993, she moved to Beijing and began to write poetry and make paintings. 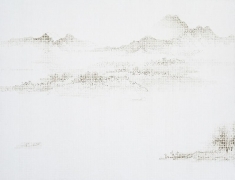 During her stay in Beijing she was awarded the Liu Lian prize for poetry. 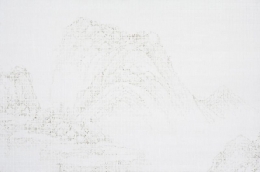 In 1998 she moved to New York and then returned to Shanghai in 2006.